Newspaper blackout and why I don’t read the news | go do. 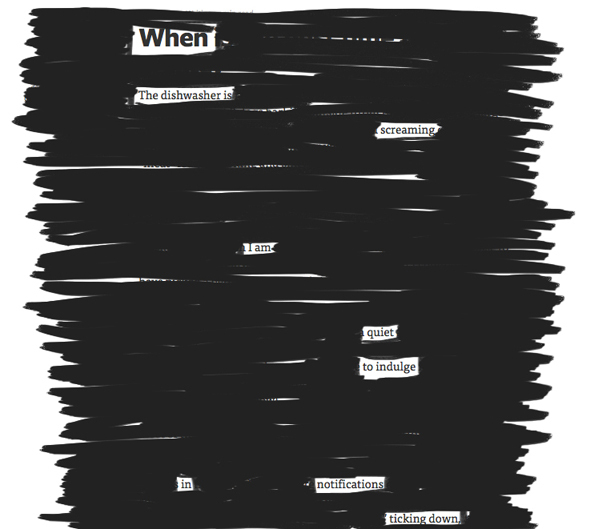 Today I discovered the beautiful Newspaper Blackout poems by Austin Kleon and wanted to try something similar. As I don’t read newspapers (I’ll get to the why in a minute) I thought I should use some text from medium as I frequently read articles on there. I picked “When is the best time to create” by Paul Jarvis because it felt exactly right for this experiment and used my Wacom Tablet to “draw” on a screenshot using Photoshop. So that is my very first poem I “wrote” in a while and I liked how easy it was to go with the the flow of the text and just picking words that popped out to me. Also, I have to admit (although it is a good read) it felt liberating to cross out all the words that didn’t fit and concentrate on some words only. That’s also the main reason I don’t read newspapers or hardly any news at all. I want to concentrate on the beautiful and positive things in life, not really blending out all the bad that happens in the world, don’t get me wrong. I just like to surround myself with inspiring stories and rather spend my mornings reading a well written book than a newspaper article full of mistakes and presumptions. What about you, are you still reading newspapers? If not, what do you enjoy to read? Great! They still make newspapers on paper?